Do you love choral music? Then don’t just visit our concerts, visit our rehearsals! We are always looking for talented and motivated singers of all voice parts. If you enjoy singing and rehearsing choral music, then we might just be the right place for you! We are about 45 singers between their mid 20s and late 50s and we continuously work on and expand our repertoire under the direction of Ulrich Brassel. 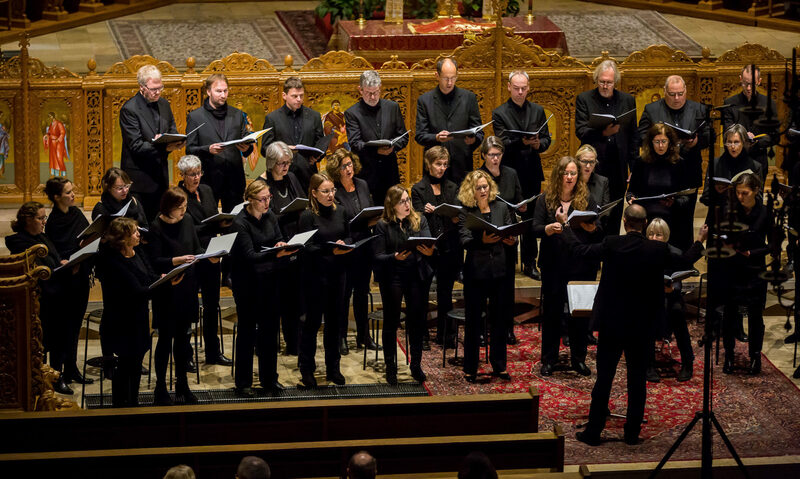 Our main focus is the study of varying choral literature for both religious and secular concerts. We perform not only ambitious and international a-cappella music from the Renaissance all the way to the modern era (ca. twice a year), but also large orchestral oratories and masses (every 2 years). In contrast to most other choirs in and around Aachen, we provide the musical accompaniment to High Mass in Aachen Cathedral – singing Latin masses and motets – about 3-4 times per year. In addition, we regularly travel with the choir to perform elsewhere, both in Germany and abroad. If you want to find out more about our repertoire, have a look here. We rehearse once a week, every Tuesday evening, from 8:00 pm until 10:00 pm. Rehearsals take place in the Domsingschule, Ritter-Chorus-Straße (entrance via Katschhof). Shortly before our concerts, we also usually meet for rehearsal-weekends and/or additional rehearsals. Do you think we might be the right choir for you? Have a go and give us a try! We´re looking forward to meeting you!